We all know how integral social media marketing is to successful businesses today. Which is why once again thousands of marketers from around the world attended the mega-event Social Media Marketing World 2019 to gain new knowledge and strategies of social media marketing to help inspire and empower their business endeavours for the year ahead. Our own Mike Rhodes was honoured with a place as guest speaker at the event talking about artificial intelligence in Google Ads for 2019. Back in October 2018, Mike was welcomed by Social Media Examiner as a guest speaker on their Social Media Marketing podcast How Artificial Intelligence is Changing Marketing to explain why marketers must understand artificial intelligence and share some of the positive impacts it can have on businesses when used correctly. Social Media Examiner loved Mike so much that they invited him back as a guest speaker to Social Media Marketing World 2019. Mike took the stage this year to further share his expertise and most recent research findings with attendees on artificial intelligence & how it’s changing marketing in Google and beyond for 2019. 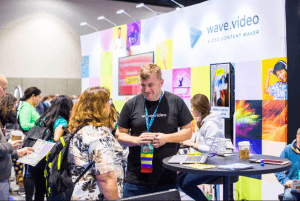 Hosted by Social Media Examiner and boasting the best content by the best speakers, Social Media Marketing World 2019 took place over the 20-22nd of March this year in San Diego, California for the 6th consecutive year. Keynote speakers for the event and Founder of Social Media Examiner Michael Stelzner began the event by sharing the newest research revelations into social media marketing in 2019. Meanwhile “The Queen of Facebook” and Forbes’ Top Social Media Power Influencer, Mari Smith guided audiences through her road map for the future of Facebook marketing. Attendees not only got to hear about the latest social media marketing information strategies and research findings, but took part in real-life workshops hosted by marketing giants SEMRush, Zoho Social, Vimeo, and wave.video to build relevant network connections and strengthen their industry skills. With the event site San Diego Convention Centre surrounded by lush beaches and entertainment parks, the mega-event knew how to promote its surroundings, encouraging attendees to remember to mix business with pleasure over the event weekend and hosted parties each night to build more meaningful network connections. It’s easy to see why many attendees of Social Media Marketing World return every year. With inspiring content from social media marketing giants and industry experts, great nightlife and free workshops surrounded by California beaches and like-minded people, you’d want to return too. Really, the Social Media Marketing World 2018 highlight reel says it all.